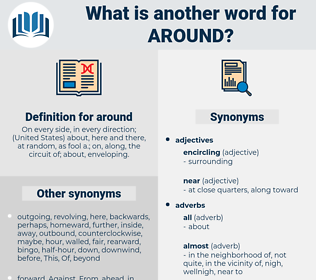 What is another word for around? On every side, in every direction; ( United States) about, here and there, at random, as fool a.; on, along, the circuit of; about, enveloping. everywhere, there, here, peopleand, approximatly, all, along, sometime, perhaps, closely, after, virtually, probably, globally, later. exterminated, lost, destroyed, nonextant, dead, departed, defunct, inactive, inert, kaput, extinct, gone, nonexistent, idle. How do you know your way around here so well? And then he would get up and walk around and around the house. 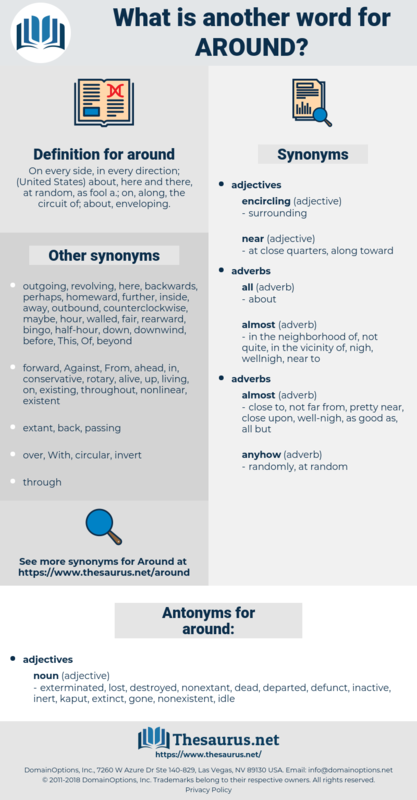 armada, arundo, Arendt, aeronaut, armament, araneida, army hut, air unit, arrant, armed, army ant, arhant, army unit, armet, area unit.